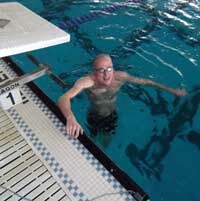 Zenergy health club in Ketchum will offer $10 passes this weekend, May 14-15, as a benefit for the AquAbility program. Zenergy fitness center in Ketchum will host an open-house fundraiser to benefit the AquAbility program May 14-15. Zenergy will offer a $10 day pass to the club, which will include use of the fitness center, classes and use of the pool. All proceeds will benefit AuqAbility. Zenergy masters swim coach Karen Morrison is the founder and coach of the AquAbility program, a nonprofit organization that provides therapeutic recreation through swimming for people with a variety of physical challenges. St. Thomas Playhouse will hold auditions for two productions this month. The Summer Theater Project will audition high school youths and young adults for the exuberant, dance-filled show "Footloose the Musical" on Saturday, May 14, from noon to 4 p.m. and Sunday, May 15, from 1-3 p.m. Auditions will be conducted on a first-come, first-served basis in the downstairs parish hall at St. Thomas Episcopal Church in Sun Valley. Auditioners should prepare 16 bars of a song and will be asked to read scenes from "Footloose." Copies of the scenes will be available in the downstairs church office. Rehearsals begin immediately after casting on May 23. The show will run from June 22-25 at the Community School Theatre. "Footloose the Musical" is a heartfelt story of acceptance and redemption with an exciting score and explosive dancing. For details, call 726-5349. The all-American favorite musical "The Music Man" will be presented by the Family Main Stage program from Oct. 13-16 at the nexStage Theatre. Community members from age 5 to 95 are invited to audition on Monday, May 16, and Wednesday, May 18, from 4-7 p.m. These auditions also will be held in the downstairs parish hall at the church. Auditioners will be asked to sing and read scenes from "The Music Man." Copies of the scenes will be available to candidates when they sign in at auditions. Adults and children must be able to commit to the rehearsal schedule, which begins in August. For details, call 726-5349. Venture into the terrifying Black Forest with Snow White and her friends this Friday and Saturday, May 13-14, when the Missoula Children's Theatre, the Stanley School and the Pioneer Montessori School perform "Snow White and the Seven Dwarfs." A musical adaptation of the classic tale, the performance is suitable for audiences of all ages. "Snow White and the Seven Dwarfs" will be presented at 7 p.m. on Friday, May 13, and 2 p.m. on Saturday, May 14, at the Stanley Elementary School. Admission is free, but donations to cover the cost will be accepted. The Missoula Children's Theatre residency in Stanley was arranged by the Stanley School Parents' Association with support from the Pioneer Montessori School. For more information, call Maryellen Easom at the Stanley School, 774-3503.